WHEN the movement becomes ecstatic then it is a dance. 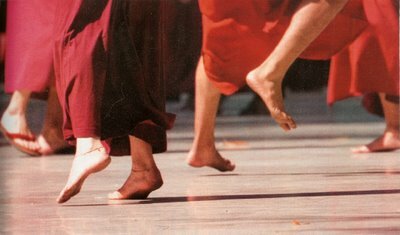 When the movement is so total there is no ego, then it is a dance. There is no need to find any other meditation. Dance itself becomes a meditation if the dancer is lost. The whole point is how to lose oneself. How you do that, or where, is irrelevant. Just lose yourself. A point comes where you are not, and still things go on… as if you are possessed. So for at least one hour every day, forget all technique. Make it a point to simply dance to God. So there is no need to be technical – because He is not an examiner. You will simply dance as a small child… as a prayer. Then dance will have a totally different quality to it. You will feel for the first time that you are taking steps that you have never taken before; that you are moving in dimensions which have never been known to you. Unfamiliar and unknown ground will be traversed. Dance as if you are deep in love with the universe, as if you are dancing with your lover. Let God be your lover.